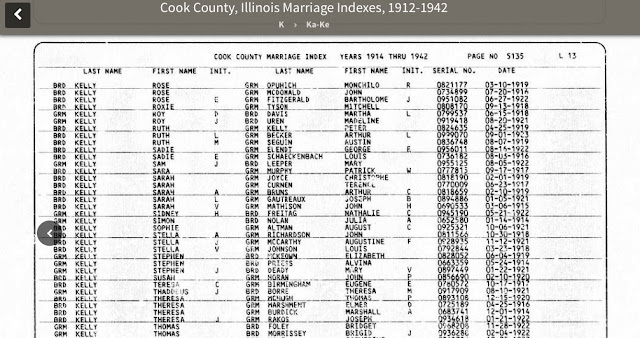 This morning I received an email from a fellow researcher mentioning that the images for Illinois, Cook County Deaths, 1878-1922 are no longer available online at FamilySearch. Unfortunately, it's true. The same is true for the Cook County birth register, birth certificate, and marriage license collections. On a positive note, the indexes remain. Two steps forward + one step back still = one step forward for Chicago researchers. If you visit the FamilySearch Wiki page Illinois, Cook County Death Records and scroll down to the "Image Visibility" section, it explains that a new contract has been negotiated with Cook County and that the records were removed as part of that agreement. The article continues on to explain that "FamilySearch will receive an additional 4.7 million records for FamilySearch patrons." I don't know what that means, but I hope it's good news. If you need access to the images that were removed, the Wiki page offers three suggestions including submitting a request to FamilySearch's Photoduplication Services, a way to get limited number of records for free. Also, for those of you in the Chicago area, most all of the films for the early records are available at the Wilmette Family History Center but check their holdings before you make the trip. I can't fill in the gap by offering free lookups, but I will add these records back to the list of documents that I can retrieve through my chicagogenealogy store on Genlighten.com. I'm wondering about the possibility of offering to take quick iPhone camera photos of the records for a budget-friendly price. They'd be quite large and readable, but they wouldn't look like images scanned directly from film or like the images that I get when I print and scan a paper copy. What do you think? Would that be of interest?